Love this wedding spread in Le-Annes and Ben's wedding album! 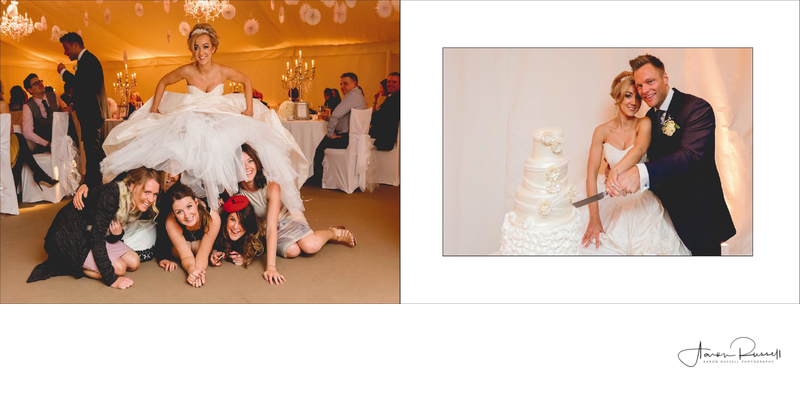 What I particularly love about the photograph on the left is how Le-Anne's husband is enjoying a moment talking to his guests whilst Le-Anne is having a crazy time demonstrating how big her wedding dress was with him blissfully unaware. As wedding dresses go, Le-Anne's has to be the biggest I have ever photographed in the last 7 years of photographing weddings! If you ever met Le-anne you'd be surprised at what a beautiful petite lady she is and how well she did to carry that dress that must have weighed almost as much as her throughout the day. The wedding was a really magical time with it being just after Christmas. With real reindeer and even a snow machine, both Le-Anne and Ben put their heart and souls into making the day special for themselves and for the amazing guests. The photograph on the right is clearly the cake cutting lol... It was an incredible cake which I have to say with cheeky experience was delicious. So often the wedding cake can be put to one side and not be eaten by the guests. I'm pleased to report though on this occasion it was. With so many hours of love put into it, it would have been such a shame if the guests didn't enjoy it. Iscoyd Park is a three-storey redbrick country house in Wrexham, Wales. It has a slate roof built in the early 18th century. It was sold in 1737 to William Hanmer. The house and estate were then purchased by Philip lake Godsal in 1843 and remains in the Godsal family to this day. Location: Iscoyd Park Hotel, Whitchurch, near Wrexham SY13 3AT.